Northern Tablelands MP Adam Marshall and Armidale Regional Council interim general manager Glenn Wilcox in front of the current Armidale Regional Airport terminal, a view that will be completely transformed by the end of 2017. THE upgrading of Armidale Regional Airport through a $6.3 million State Government grant will set the airport precinct up to become a regional transport hub. 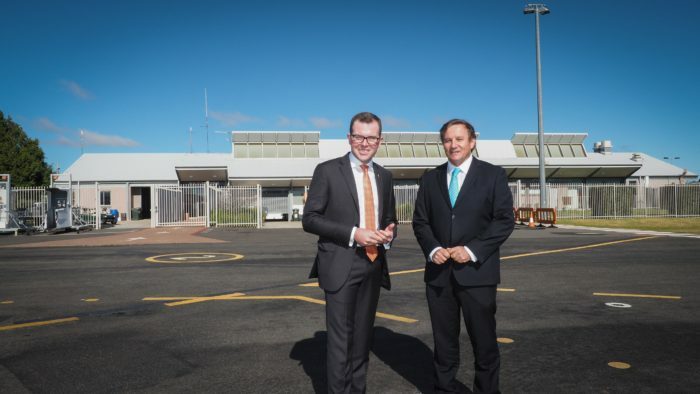 The substantial building program, which will expand the airport terminal and increase passenger capacity, was announced today by Northern Tablelands MP Adam Marshall and welcomed by Armidale Regional Council interim general manager Glenn Wilcox. “While this $6.3 million is focused on improving the airport terminal and its access by cars and planes, the bigger objective is to have a modern regional airport at the heart of a manufacturing and transport precinct,” Mr Marshall said. In December last year Mr Marshall announced $1.5 million from the government’s Regional Tourism Infrastructure Fund (RTIF) for the $2.2 million expansion the airside parking apron. “This will see the current three-bay parking apron extended to allow four aircraft, three of which could be the larger Dash 8 Q400s, to make use of the apron at the same time and remove existing restrictions,” Mr Marshall said. Mr Wilcox said the initial objective of the upgrade was to improve the airport experience for passengers and airlines, and lay the foundations for future developments. “It will allow us to increase airline services, and to increase passenger numbers from the current 140,000 seats a year to 200,000 seats,” Mr Wilcox said. The upgrade will wrap the current terminal building in a much bigger structure that will provide the capacity for baggage scanning – a prerequisite if larger passenger aircraft, like the Bombardier Q400, are to be used on the Armidale route. The expanded terminal will have a new cafe and retail area, a baggage carousel, and more passenger seating. Car parking capacity will be doubled, and the airside apron expanded to allow bigger aircraft to use the facility. Mr Wilcox hopes that tenders for the work will be complete by the end of this year, and that the terminal upgrade will be largely done by the end of 2017. The terminal is just an initial step in a long-term plan for the precinct. Council is working on the release of land for a new industrial area and business park, and a large service centre. As this development grows, it will bolster the case for a new runway to take bigger aircraft and to justify the case for equipment to make instrument-only aircraft movements possible.